I've feeling somewhat disjointed at the moment and very disorganised which is a feeling I hate! Life has been incredibly busy recently-I was in Cairo all last week on a very hectic business trip where the shortest day was 18 hours long, my parents are currently with us in Dubai which is wonderful but my week at work this week has been the busiest this year and an emotional roller coaster for one reason and another and a work life balance has been challenging. Next week I am heading back to Cairo for a week to work. I think I have to accept in times like this something has to give and it's my blog. I have lots of posts in draft form-with the photos edited and uploaded but the posts have no words-yet. I'll get round to it at some point but family and what pays the bills has to come first! 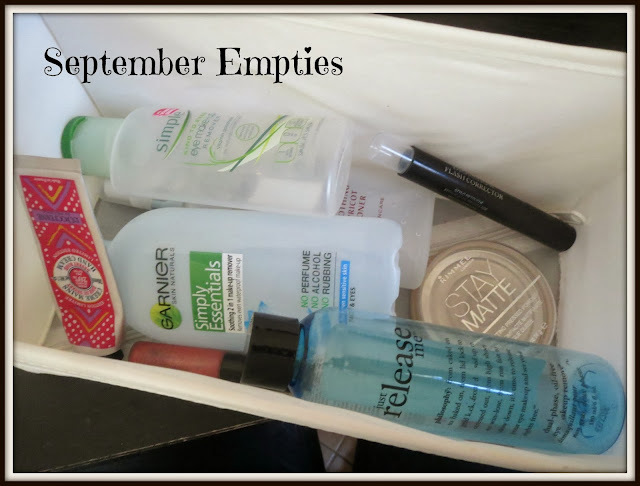 So, slightly late, here are my September empties. Again this is a little disjointed as I was in three different countries during the month and I had empties in all three so the photos don't all match sorry! My first two empty products ran out when I was in the UK. My skin was really suffering in the UK-perhaps the change in water but I had a few spots that were just not clearing. One morning I used the last of this Bliss Triple Oxygen Energizing Mask whilst in the shower and it was literally a game changer for my skin and it cleared up immediately. It's a 5 minute mask you apply to wet skin and it frothes up looking like you have covered your face in shaving foam! It gives a good dose of Vitamin C to the skin and my skin really really sorted itself out after using this and has been (touch wood) great since. This was a sample size but a full size one retails for £39. Pricey but I think I would be tempted to repurchase. My second empty is a bronzer from Shu Uemura. I had the lightest shade and it was perfect for my skin-it has a grey undertone rather than an orange one so I never looked over bronzed when using it. But, I can't find this on the Shu website so I think it must be discontinued. Shame, because this is the perfect bronzer for pale girls like me and I would recommend it to anyone. My next empties I finished in Cairo and it was the Effaclar Duo exfoliating toner from La Roche Posay and the Elemental Herbology Cool and Clear facial cleanser. I loved both these products. The La Roche Posay exfoliating toner is my first step in my double tone routine. It was also the first exfoliating toner I had ever used. You get a slight tingle and warming off the skin when you apply it but I have found it faded older acne scars and kept my skin clear without stripping it. Exfoliating toners kick your skin into action and are important for skin cell renewal. Exfoliating toners will contain acids and will exfoliate your skin without the need for granule based exfoliants which can be harsh on the skin. They should tingle when you apply them to your skin. This toner lasted ages and although I am using another one right now (as I have about 4 different brands in my stash) I would definitely repurchase this as it's probably the cheapest of them all. Would I repurchase? Yes-well unless I find one of the other exfoliating toners I have is Uh-mazing! What have I replaced it with? A Michael Todd Organic Lemon AHA toner-which is really nice. The Elemental Herbology Cool and Clear Facial Cleanser is the perfect morning cleanser. It's a low foaming gel which gently refreshes the skin and rinses off easily. I really liked the packaging, it had a vacuum dispenser which means you don't waste a drop and can see how much you have left. My only criticism is that you needed a good 7-8 pumps of the cleanser to get enough for the whole face. What have I replaced it with? The Ren Clearcalm Anti Blemish Clay cleanser. To regular readers it will come as no surprise to see the Simple Eye Make Up Remover and the Garnier Soothing 2 in 1 make up remover in my empties. I love these two eye make up removers so much-they are holy grail products for me. I was on my last bottle of each but luckily my mum brought me over 4 of each which will see me through til I am next in the UK! The Philosophy Just Release Me however is an amazing eye make up remover! It's duo phase so I assumed it was an oil and water hybrid like the Garnier or Lancome Bi Facil but it's actually oil free so leaves no oily residue like the Garnier/Lancome. But it was amazingly effective on even waterproof mascara and it was massively impressive. It's full of soothing ingredients like aloe and camomile too. It's a bit more expensive at $18 a bottle and you can't buy it in the UK or Dubai so I would have to order from the US which is a bit of a downside. But it's an amazing product. What have I replaced it with? Simple and Garnier of course! I also finished up my hydrating toner last month which was the Elemis Soothing Apricot Toner. This was also a really nice toner which I spritzed onto my skin after using the La Roche Posay toner. A hydrating toner will contain ingredients like hyaluronic acid and glycerin and aloe vera. The primary purpose is to keep your skin hydrated and plumped. This toner did a good job and I liked the fact it came in a spray pump making it easy to use and quick to dry. I finally jumped on the blogger bandwagon and tried Hydraluron. I don't honestly think I saw huge benefits other than I needed less moisturiser. When I apply it I find it seems to tighten the skin immediately which seems strange for something that is supposed to be rehydrating the skin and putting moisture back in. I used it in the morning after toning and before my moisturiser. What have I replaced it with? I have started using Estee Lauder Idealist as a serum underneath my normal moisturiser again in the mornings. Moving on to make up, I finished up the Dior Flash Corrector. This was a gift from my best friend for my birthday and I had never seen it before but it's a proper nifty little thing to own. Basically its a pen loaded with make up remover that you can use on the go to clear up any make up smudges-for me that would usually be under my eyes. It comes with 4 re-useable tips and lasted me 6 months which is pretty good going. It's really effective, non oily and was always in my make up bag. Not an empty as such but a product past its best is the YSL Shocking Eyeliner. I am not really an eyeliner wearer in all honesty, I am not great at applying it and often can't be bothered. This is a felt pen liner but with quite a fat nib. It's fairly easy to use but I found it did smudge a bit on me. What have I replaced it with? The Physicians Formula liquid liner which has a much finer nib. I also finished a Mac LipGlass in Viva Glam VI. This is a neutral pink lipglass but with subtle glitter impregnated. Very easy to wear-Mac call it 'warm plum' but I would say it's a 'my lips but better' shade. If you don't know the story behind Mac's Viva Glam range, every cent goes towards helping women, men and children suffering with HIV/AIDS. Finally I used up the L'Occitane Desert Rose hand cream-this was a sample size and it still took me 12 months to use up!!! I am SO bad at applying hand cream. As hand creams go, this is a lovely one-smelt good and absorbed quickly. Would I repurchase? Probably not-I just don't do hand cream! What have I replaced it with? I am currently hand cream free! My last empty product for September was the Rimmel Stay Matte powder. I know this is a blogger favourite but I find it to be a little cakey and that it didn't control shine very well. I recently bought the Soap and Glory One Heck Of A Blot and I think that the S&G blows the Rimmel out of the water-it's much more finely milled and more effective. It's also not very travel friendly and I would only use it at home. You can read mini reviews of some of my replacement products here in my recent New Additions post. I think I have more positive feelings about my empties this month than my August empties where most of the products I wouldn't repurchase. The majority of this months empties I would repurchase-but I have a bit of a stash to get through first! !